Use the following information and examples to gain a more advanced understanding of Azure Active Directory (Azure AD) group-based licensing. Some Microsoft services are not available in all locations. Before a license can be assigned to a user, the administrator has to specify the Usage location property on the user. In the Azure portal, you can specify in User > Profile > Settings. You can use group-based licensing with any security group, which means it can be combined with Azure AD dynamic groups. Dynamic groups run rules against user object attributes to automatically add and remove users from groups. For example, you can create a dynamic group for some set of products you want to assign to users. Each group is populated by a rule adding users by their attributes, and each group is assigned the licenses that you want them to receive. You can assign the attribute on-premises and sync it with Azure AD, or you can manage the attribute directly in the cloud. Licenses are assigned to the user shortly after they are added to the group. When the attribute is changed, the user leaves the groups and the licenses are removed. Consider the example of an on-premises identity management solution that decides which users should have access to Microsoft web services. It uses extensionAttribute1 to store a string value representing the licenses the user should have. Azure AD Connect syncs it with Azure AD. For this example, modify one user and set their extensionAttribute1 to the value of EMS;E5_baseservices; if you want the user to have both licenses. You can make this modification on-premises. After the change syncs with the cloud, the user is automatically added to both groups, and licenses are assigned. Use caution when modifying an existing group’s membership rule. When a rule is changed, the membership of the group will be re-evaluated and users who no longer match the new rule will be removed (users who still match the new rule will not be affected during this process). Those users will have their licenses removed during the process which may result in loss of service, or in some cases, loss of data. If you have a large dynamic group you depend on for license assignment, consider validating any major changes on a smaller test group before applying them to the main group. As a result, the user has 7 of the 12 services in the product enabled, while using only one license for this product. Selecting the E3 license shows more details, including information about which groups caused what services to be enabled for the user. When a user inherits a license from a group, you can't directly remove or modify that license assignment in the user's properties. Changes must be made in the group and then propagated to all users. It is possible, however, to assign the same product license directly to the user, in addition to the inherited license. You can enable additional services from the product just for one user, without affecting other users. Directly assigned licenses can be removed, and don’t affect inherited licenses. Consider the user who inherits an Office 365 Enterprise E3 license from a group. Yammer Enterprise can be turned off on the user object directly. The On/Off toggle in the illustration was enabled for this service, as opposed to the other service toggles. Because the service is enabled directly on the user, it can be modified. Additional services can be enabled as well, as part of the directly assigned license. When Microsoft adds a new service to a product, it will be enabled by default in all groups to which you have assigned the product license. Users in your tenant who are subscribed to notifications about product changes will receive emails ahead of time notifying them about the upcoming service additions. As an administrator, you can review all groups affected by the change and take action, such as disabling the new service in each group. For example, if you created groups targeting only specific services for deployment, you can revisit those groups and make sure that any newly added services are disabled. 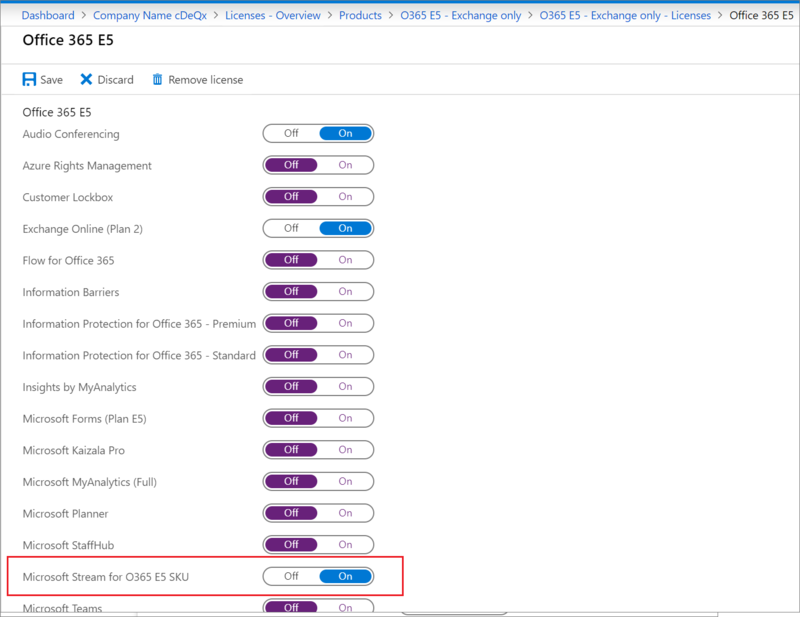 Originally, you assigned the Office 365 Enterprise E5 product to several groups. One of those groups, called O365 E5 - Exchange only was designed to enable only the Exchange Online (Plan 2) service for its members. Go to the Azure Active Directory > Licenses > All products blade and select Office 365 Enterprise E5, then select Licensed Groups to view a list of all groups with that product. Click on the group you want to review (in this case, O365 E5 - Exchange only). This will open the Licenses tab. Clicking on the E5 license will open a blade listing all enabled services. If you want to disable the new service in this group, click the On/Off toggle next to the service and click the Save button to confirm the change. Azure AD will now process all users in the group to apply the change; any new users added to the group will not have the Microsoft Stream service enabled. Users may still have the service enabled through some other license assignment (another group they are members of or a direct license assignment). If needed, perform the same steps for other groups with this product assigned. You can use a PowerShell script to check if users have a license assigned directly or inherited from a group. Run the connect-msolservice cmdlet to authenticate and connect to your tenant. Get-MsolAccountSku can be used to discover all provisioned product licenses in the tenant. Use the AccountSkuId value for the license you are interested in with this PowerShell script. This will produce a list of users who have this license with the information about how the license is assigned. what license changes were made to a user as a result of a group license assignment. Audit logs are available on most blades in the Azure Active Directory section of the portal. Depending on where you access them, filters may be pre-applied to only show activity relevant to the context of the blade. If you are not seeing the results you expect, examine the filtering options or access the unfiltered audit logs under Azure Active Directory > Activity > Audit logs. Set the Activity filter to Set group license and click Apply. The results include all cases of licenses being set or modified on groups. You can also type the name of the group in the Target filter to scope the results. Click an item in the list view to see the details of what has changed. Under Modified Properties both old and new values for the license assignment are listed. When a license changes on a group, Azure AD will start applying the changes to all users. To see when groups started processing, set the Activity filter to Start applying group based license to users. Note that the actor for the operation is Microsoft Azure AD Group-Based Licensing - a system account that is used to execute all group license changes. Click an item in the list to see the Modified Properties field - it shows the license changes that were picked up for processing. This is useful if you made multiple changes to a group and you are not sure which one was processed. Similarly, to see when groups finished processing, use the filter value Finish applying group based license to users. Initiated By (Actor): "Microsoft Azure AD Group-Based Licensing"
This sample output shows the start of processing, all resulting user changes, and the finish of processing. Clicking items related to Change user license will show details for license changes applied to each individual user. 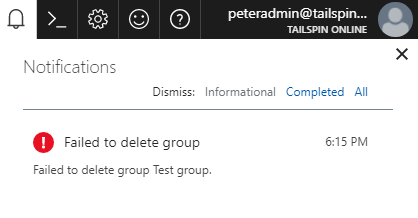 It is not possible to delete a group with an active license assigned. An administrator could delete a group not realizing that it will cause licenses to be removed from users - for this reason we require any licenses to be removed from the group first, before it can be deleted. Go to the Licenses tab on the group and see if there are any licenses assigned. If yes, remove those licenses and try to delete the group again. You may see similar errors when trying to delete the group through PowerShell or Graph API. If you are using a group synced from on-premises, Azure AD Connect may also report errors if it is failing to delete the group in Azure AD. In all such cases, make sure to check if there are any licenses assigned to the group, and remove them first. If you use group-based licensing, it's a good idea to familiarize yourself with the following list of limitations and known issues. Group-based licensing currently does not support groups that contain other groups (nested groups). If you apply a license to a nested group, only the immediate first-level user members of the group have the licenses applied. The feature can only be used with security groups, and Office 365 groups that have securityEnabled=TRUE. The Microsoft 365 admin center does not currently support group-based licensing. If a user inherits a license from a group, this license appears in the Office admin portal as a regular user license. If you try to modify that license or try to remove the license, the portal returns an error message. Inherited group licenses cannot be modified directly on a user. When licenses are assigned or modified for a large group (for example, 100,000 users), it could impact performance. Specifically, the volume of changes generated by Azure AD automation might negatively impact the performance of your directory synchronization between Azure AD and on-premises systems. If you are using dynamic groups to manage your user’s membership, verify that the user is part of the group, which is necessary for license assignment. If not, check processing status for the membership rule of the dynamic group. In certain high load situations, it may take a long time to process license changes for groups or membership changes to groups with existing licenses. If you see your changes take more than 24 hours to process group size of 60K users or less, please open a support ticket to allow us to investigate. License management automation does not automatically react to all types of changes in the environment. For example, you might have run out of licenses, causing some users to be in an error state. To free up the available seat count, you can remove some directly assigned licenses from other users. However, the system does not automatically react to this change and fix users in that error state. As a workaround to these types of limitations, you can go to the Group blade in Azure AD, and click Reprocess. This command processes all users in that group and resolves the error states, if possible.